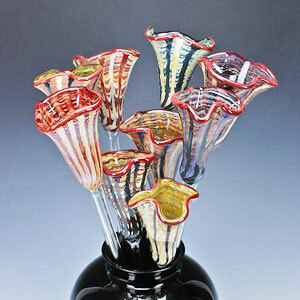 Kahlil Deerman is a flameworking glass artist of over 8 years. Kahlil first became interested in glass while he was a freshman in college at Fort Lewis College in Durango, CO. Over the following several years, Kahlil’s interest in glass became a full blown passion. 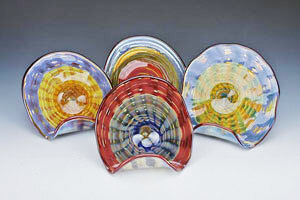 After completeing his bachelors degree in Environmental Design from the University of Colorado in 2000, Kahlil dedicated himself to the exploration of many flameworking techniques. A background based in architectural design has had a profound influence in his work in terms of composition, style, color and approach. Kahlil operates a high powered oxygen/propane gas torch to melt and manipulate the hot glass, and a large kiln to anneal all of his work to the highest standard in quality.